Atlantis Underwater Islands are crab habitats that allow crabs to live on dry land at the bottom of your aquarium. Because crabs need air, it used to be very hard to keep them in your fish’s aquarium. But now, it is all possible because your crab can just swim to the bottom of the tank and enter into dry land. It is perfect for your crabs habitat. It can dry out, breathe air, and eat all beneath the water on dry land. In the wild crabs habitats are wet and dry areas because they require both. Because we want to give our crabs close to the same habitat that they have in the wild many people who have crabs in their fish aquarium have to take them out two or three times per day. The underwater island provides everything to make your fish tank perfect for your crabs habitat, a very natural habitat. Because so many crabs vary in size we have made Atlantis products so that even large fiddler crabs can fit nicely into our crabs habitats. It is also very fun to feed the crabs with our feeder tube. You just put the tube down into the crabs habitat and slide crickets down the tube. Crabs love eating crickets! When it comes to crab habitats we are number one. We provide the right product for the right price for almost any fish aquarium. You cant go wrong with an Atlantis Underwater Product if you have crabs in your tank. Your crab will be able to live naturally and comfortably at the bottom of your fish tank on dry land. 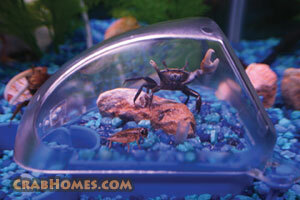 It is very fun to see the different personalities of your crabs as they live in such a perfect crab habitat.